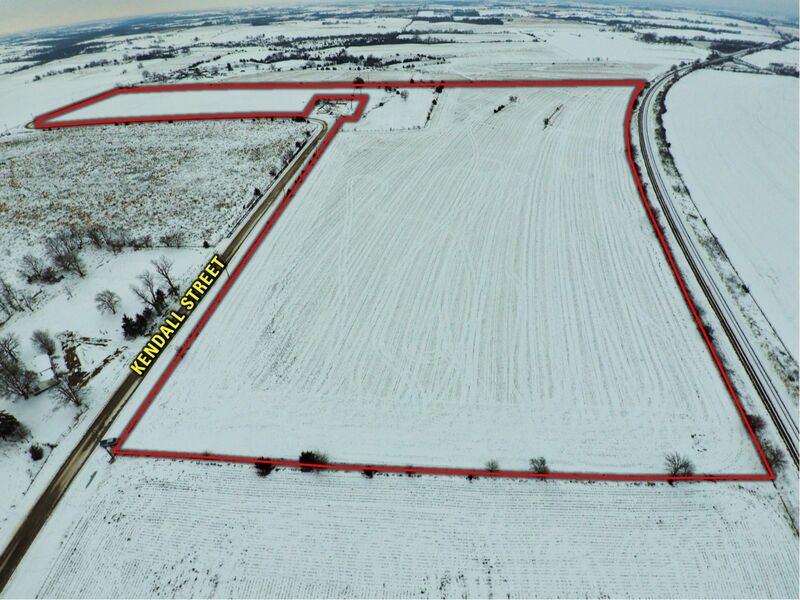 Peoples Company is excited to offer 181.78 acres m/l of high quality tillable ground and excellent pasture to be sold at public auction on March 1st at the Meeting Place in Osceola, Iowa at 10:00 AM. The farms will be sold in three individual tracts. The farm leases have been terminated and will be open for the 2019 season. 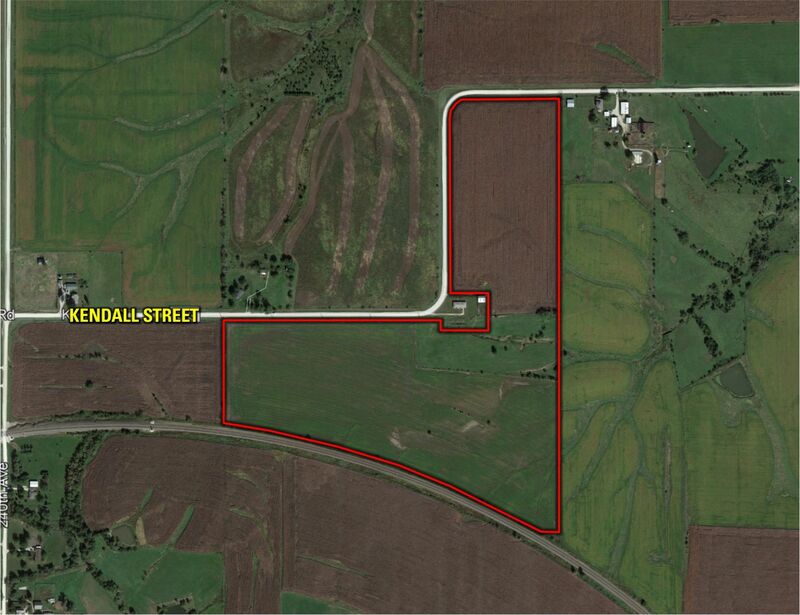 Tract 1 features 61.78 acres m/l with a tillable CSR2 of 71.5. 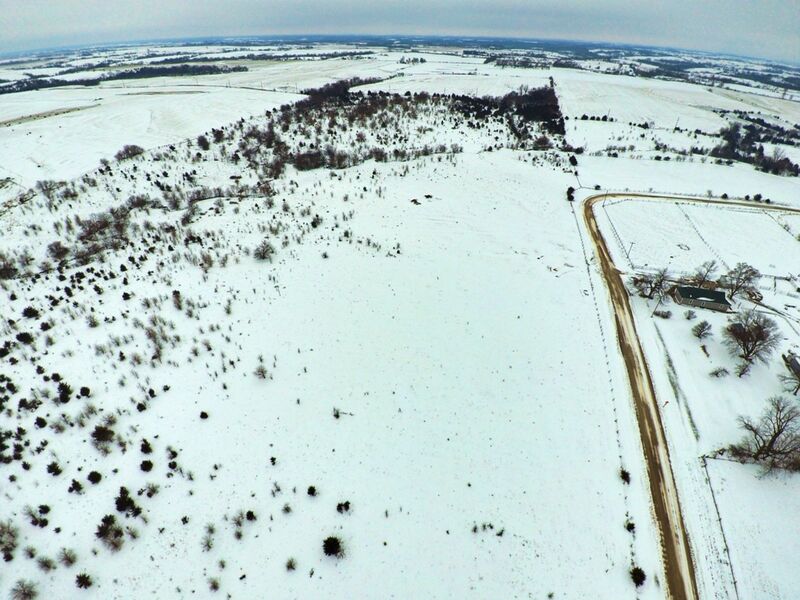 Tracts 2 & 3 total 120 acres m/l of high quality pasture and recreational ground. There are multiple building sites on these farms with easy access to water and electric. Come take a look. Tract 1: The North 23 acres in the Northeast Quarter (NE 1/4) of the Northwest Quarter (NW 1/4) and the West (W) PT of the Northwest Quarter (NW 1/4) of the Northeast Quarter (NE 1/4) lying North (N) of Rail Road (RR) Right - Of - Way (ROW) Except Parcel "G". in Section 16 Township 72 North Range 25 West. 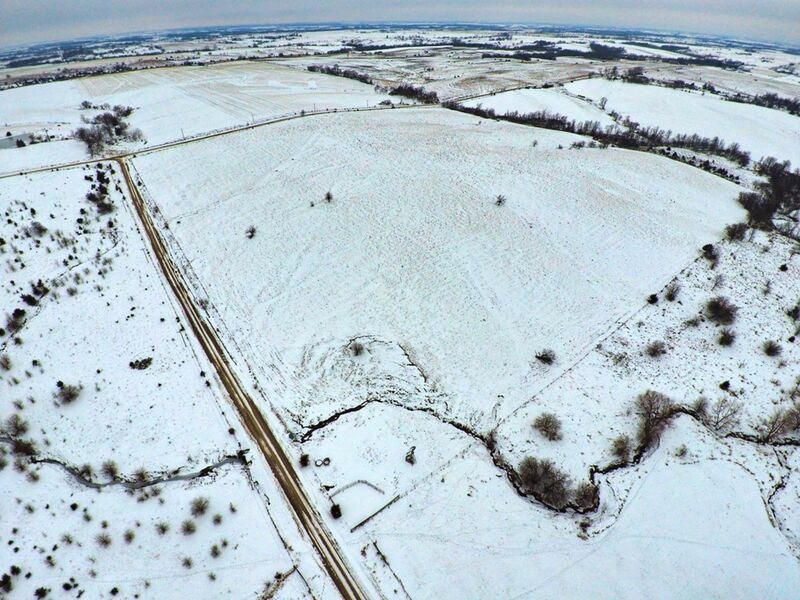 The West (W) 21.5 acres in the Southwest Quarter (SW 1/4) of the Southeast Quarter (SE 1/4) in Section 9 Township 72 North Range 25 West of the 5th P.M., Clarke County, Iowa. EXCEPT tract in Southwest Quarter (SW 1/4) of the Southeast Quarter (SE 1/4) Section 9 and the Northwest (NW) corner of the Northwest Quarter (NW 1/4) of the Northeast Quarter (NE 1/4) of Section 16. Exact legal will be taken form the abstract. Tract 2: The Southwest Quarter (SW 1/4) of the Northwest Quarter (NW 1/4) Section 10 Township 72 North Range 25 West of the 5th P.M., Clarke County Iowa. Exact legal will be taken from the abstract. 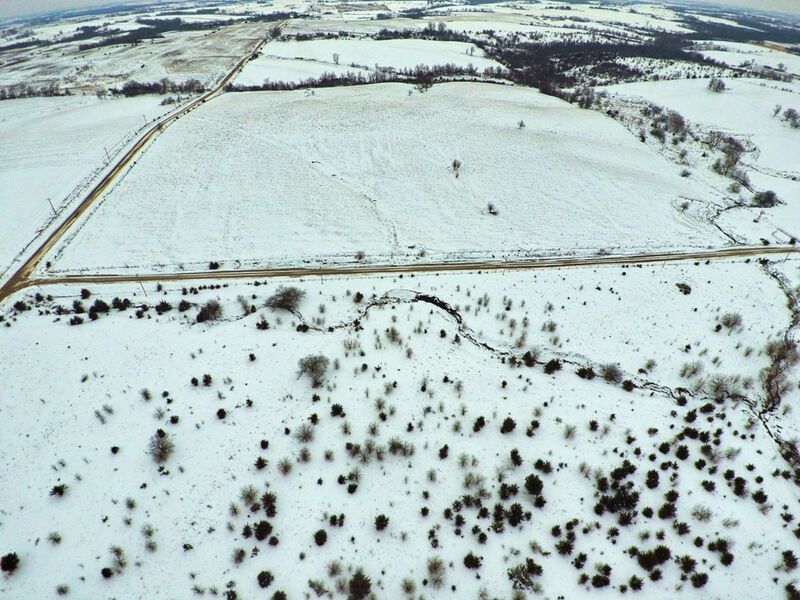 Tract 3: The West Half (W 1/2) of the Southwest Quarter (SW 1/4) of the Section 10 Township 72 North Range 25 West of the 5th P.M., Clarke County Iowa. Exact legal will be taken from the abstract. Sale Method: The property will be offered in three individual tracts. Tracts will be sold on a price per acre basis. Farm Program Information: Farm Program Information is provided by the Clarke County Farm Service Agencies. 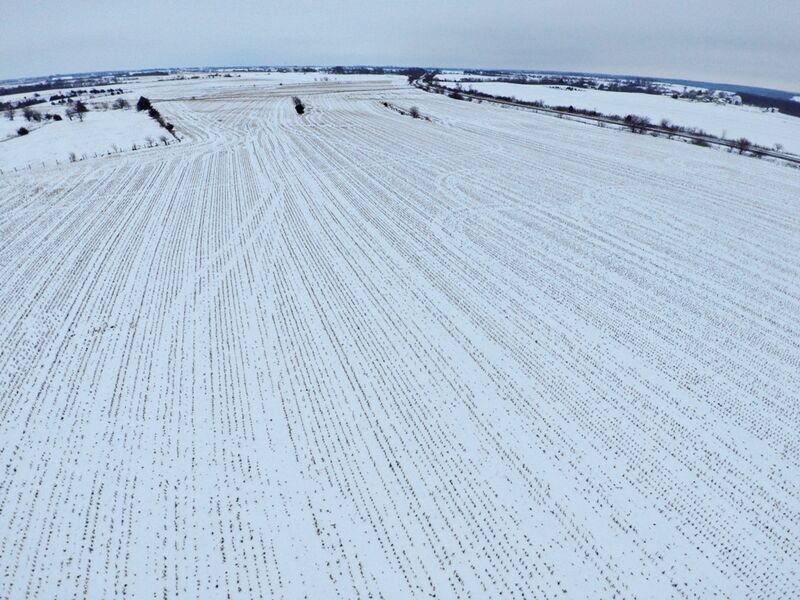 The figures stated in the marketing material are the best estimates of the Seller and Peoples Company, however, Farm Program Information, base acres, total crop acres, conservation plan, etc. are subject to change when the farm is reconstituted by the Clarke County FSA and NRCS offices. Closing: Closing will occur on or about April 16, 2019. The balance of the purchase price will be payable at closing in the form of cash, guaranteed check, or wire transfer. 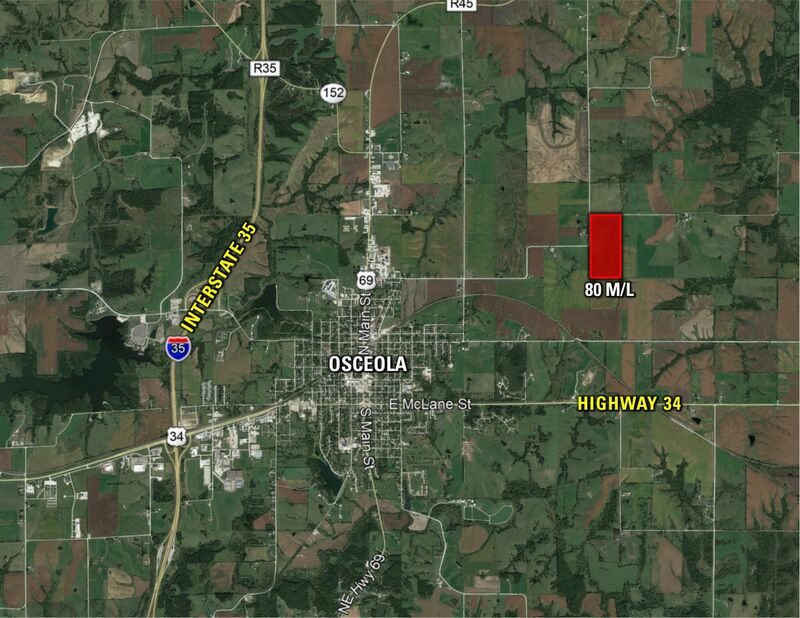 Tract 1 consists of 61.78 acres m/l of high quality tillable ground located approximately 1 mile east of the Osceola City Limits. 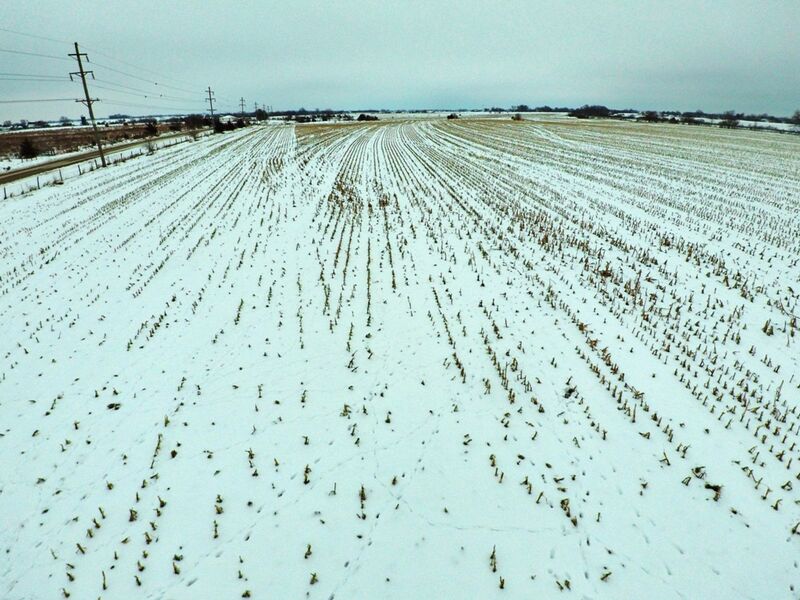 There are 55.27 acres of FSA tillable ground carrying a CSR2 of 71.5 with primary soil types of Grundy and Haig. 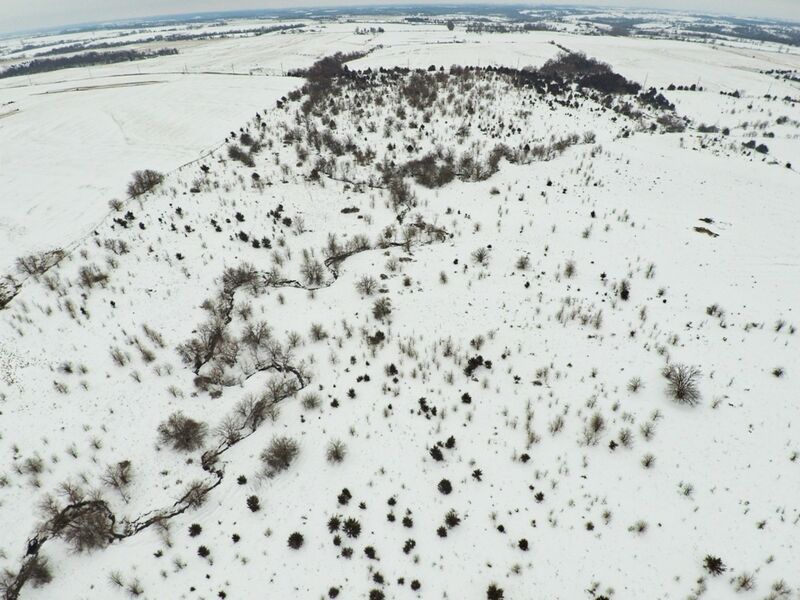 There is also approximately 7 acres of fenced pasture on this tract with a CSR2 of 53.6, and would require a sod bust plan in order to be placed into row crop production. Buyer's pay attention here, there is a limited amount of 70+ CSR2 farmland in Clarke County and we have some of the best for sale right here. Don't miss out on an incredible oppurtunity! The North 23 acres in the Northeast Quarter (NE 1/4) of the Northwest Quarter (NW 1/4) and the West (W) PT of the Northwest Quarter (NW 1/4) of the Northeast Quarter (NE 1/4) lying North (N) of Rail Road (RR) Right - Of - Way (ROW) Except Parcel "G". in Section 16 Township 72 North Range 25 West. 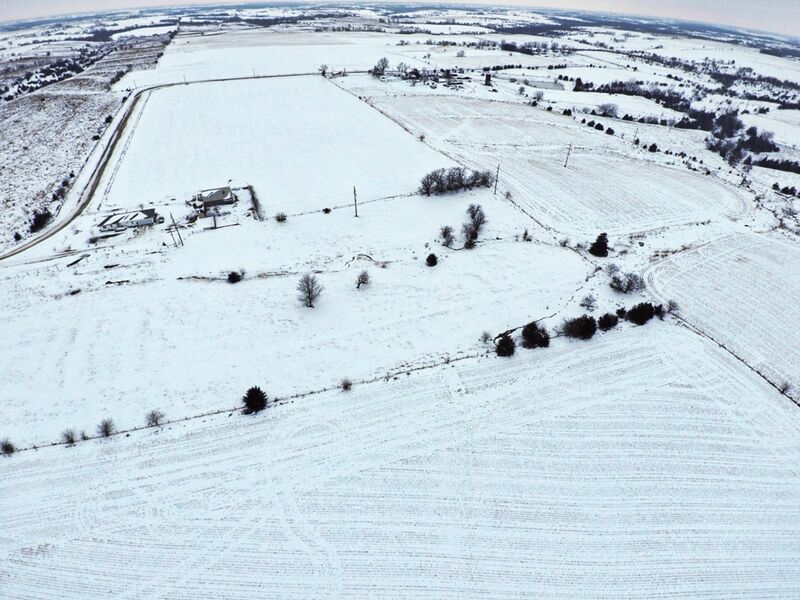 The West (W) 21.5 acres in the Southwest Quarter (SW 1/4) of the Southeast Quarter (SE 1/4) in Section 9 Township 72 North Range 25 West of the 5th P.M., Clarke County, Iowa. EXCEPT tract in Southwest Quarter (SW 1/4) of the Southeast Quarter (SE 1/4) Section 9 and the Northwest (NW) corner of the Northwest Quarter (NW 1/4) of the Northeast Quarter (NE 1/4) of Section 16. Exact legal will be taken form the abstract. From Osecola travel North on Highway 69/ N Main St. and turn East onto Townline Rd. and travel for approximately 1.3 miles. 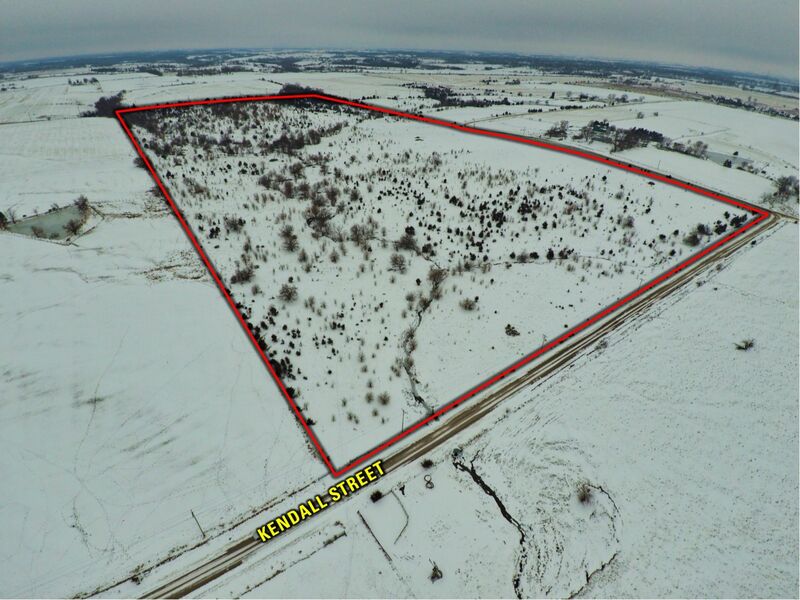 The property is situated on the South side of the first curve North of Kendall St.
Tract 2 consists of 40 acres m/l of high quality pasture ground located just 2 miles northeast the Osceola city limits. 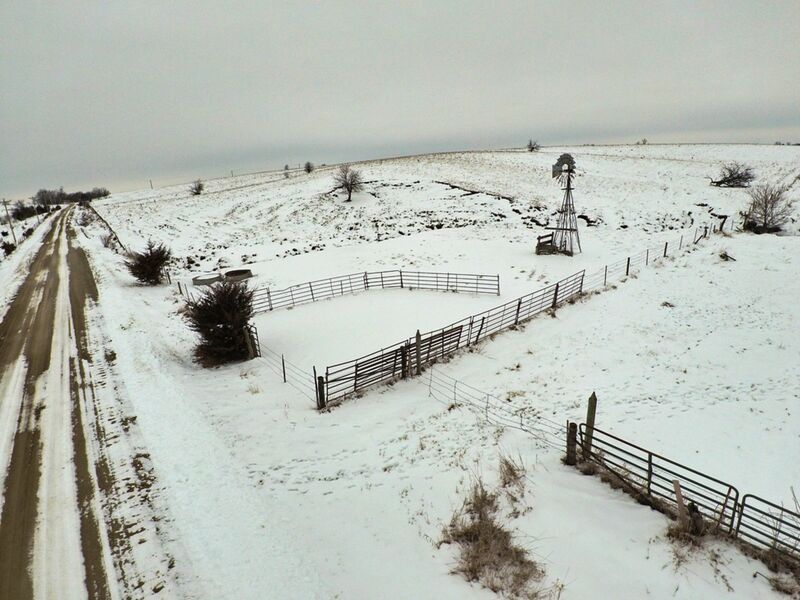 This property features a windmill and 45 foot well for watering your livestock. 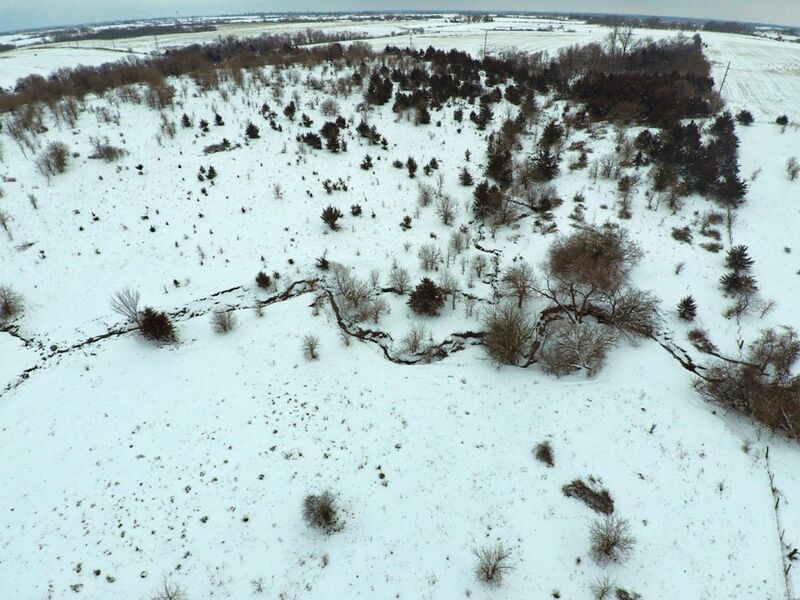 There is also a small creek that runs through the southeast corner of the property for an additional water source although additional water is not needed. This tract has a 40.8 CSR2 and will produce a high volume of grass. This location would also make an excellent building site with electric and rural water running past the property and excellent views of the rural landscape. The corral in the corner is not included in the sale. The Southwest Quarter (SW 1/4) of the Northwest Quarter (NW 1/4) Section 10 Township 72 North Range 25 West in Clarke County Iowa. Exact legal will be taken from the abstract. From Osecola travel North on Highway 69/ N Main St. and turn East onto Townline Rd. and travel for approximately 2.3 miles and turn right to stay onto Kendall St. 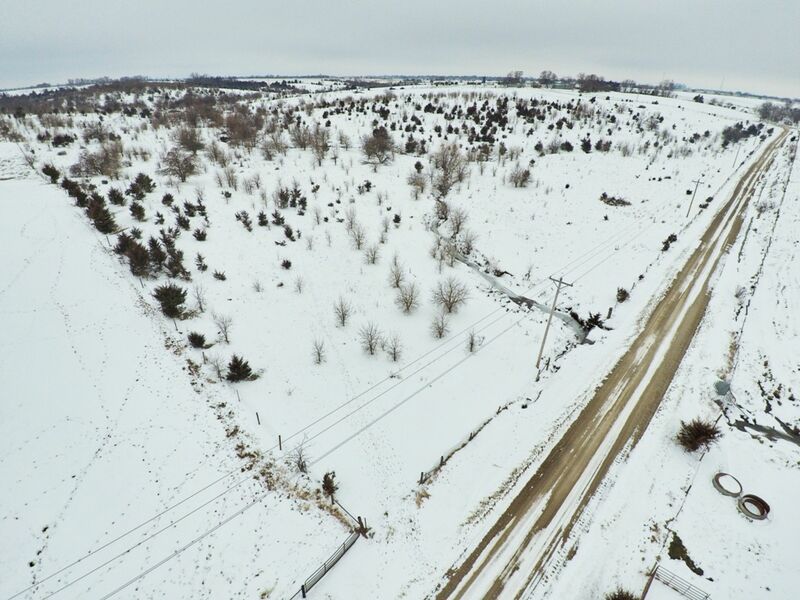 The property lies on the North side of the road. 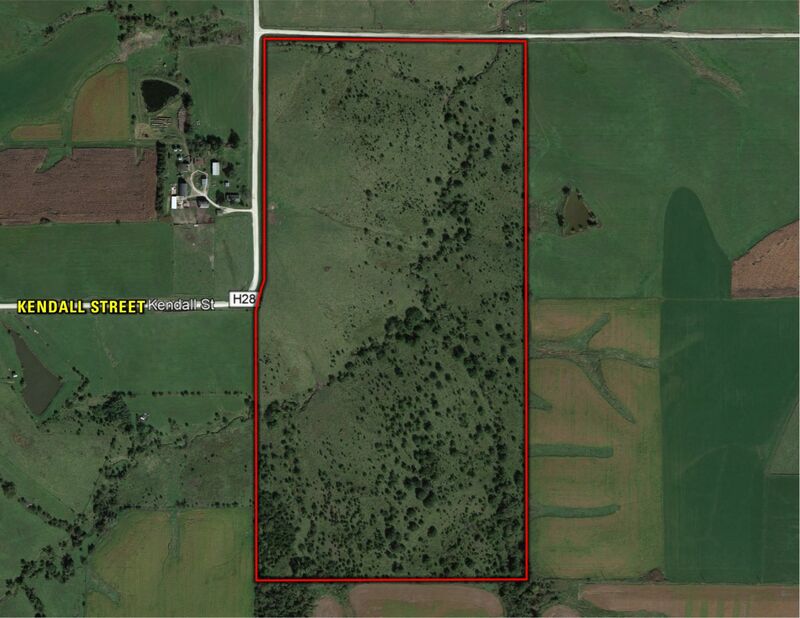 Tract 3 consists of 80 acres m/l of high quality pasture/hunting ground located approximately 1.5 miles northeast from the Osceola City limits. 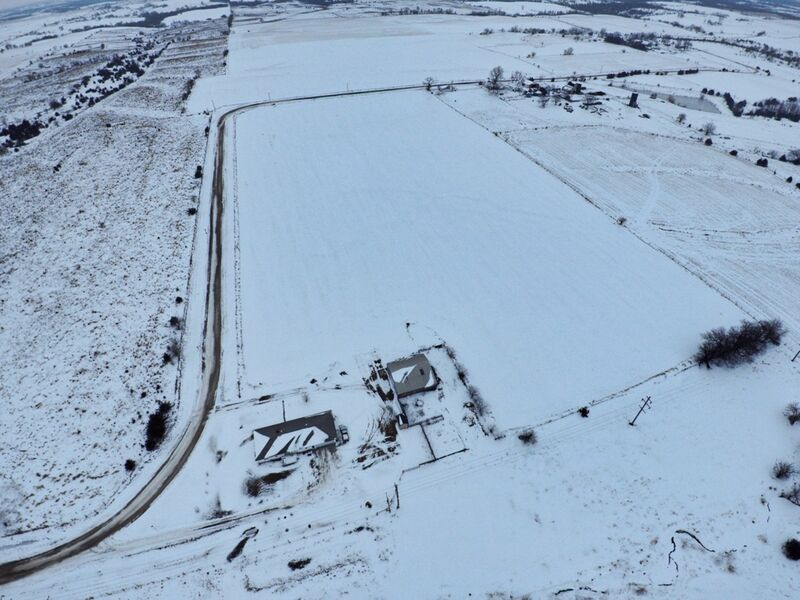 This farm has great building potential with rural water on-site and electric running past the property. The cattle waterer's are hooked up to rural water (SIRWA). This tract is an excellent grass producer with a 44.5 CSR2 and has plenty of shade. 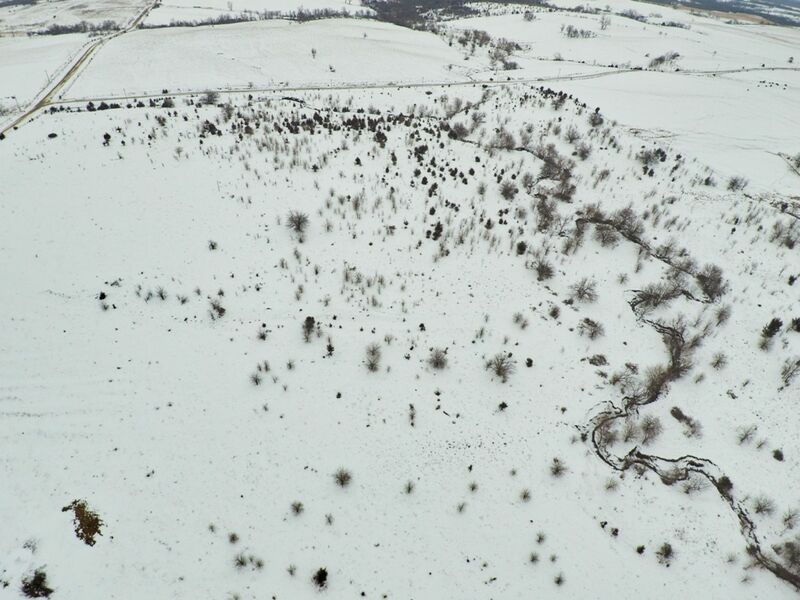 The south side of the farm has good stand of trees with several cedar thickets for wildlife cover. 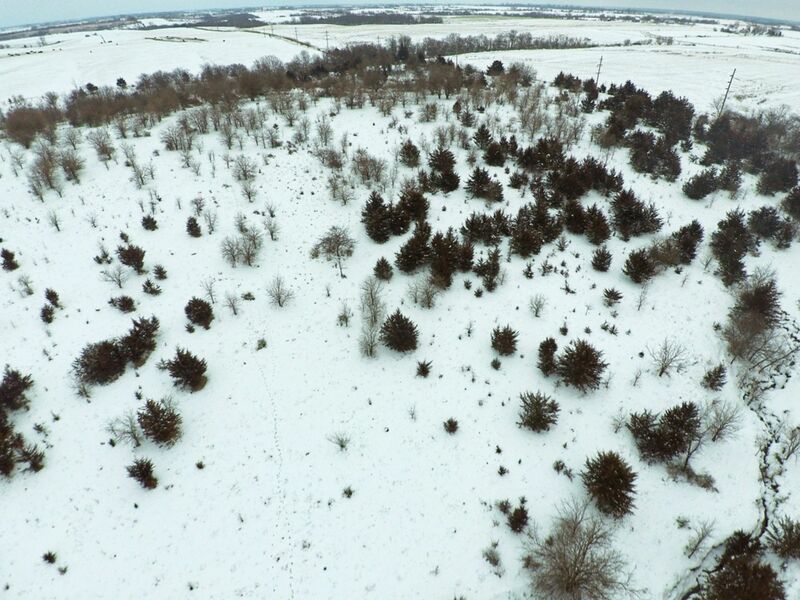 The deer and turkey are abundant and use the cedars as their primary bedding area. 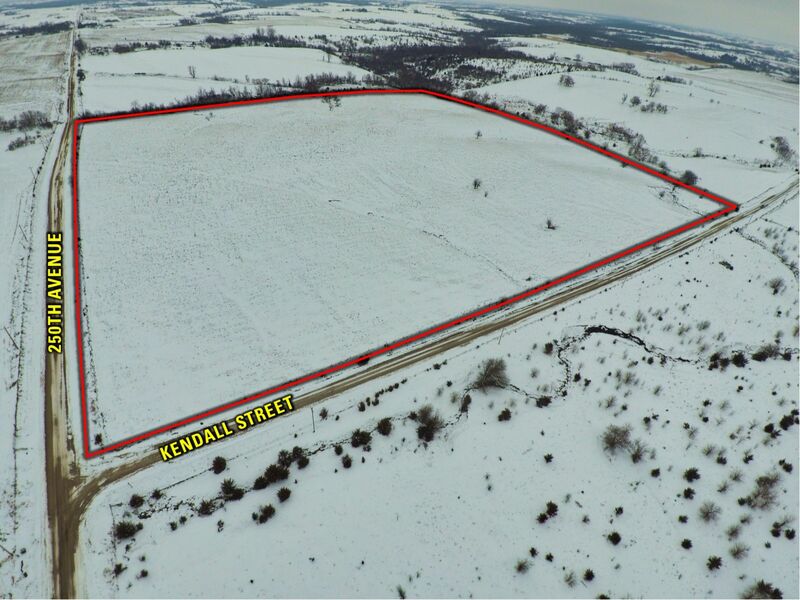 If you are looking for a place to build with lots of room for livestock and recreation you have to see this property. 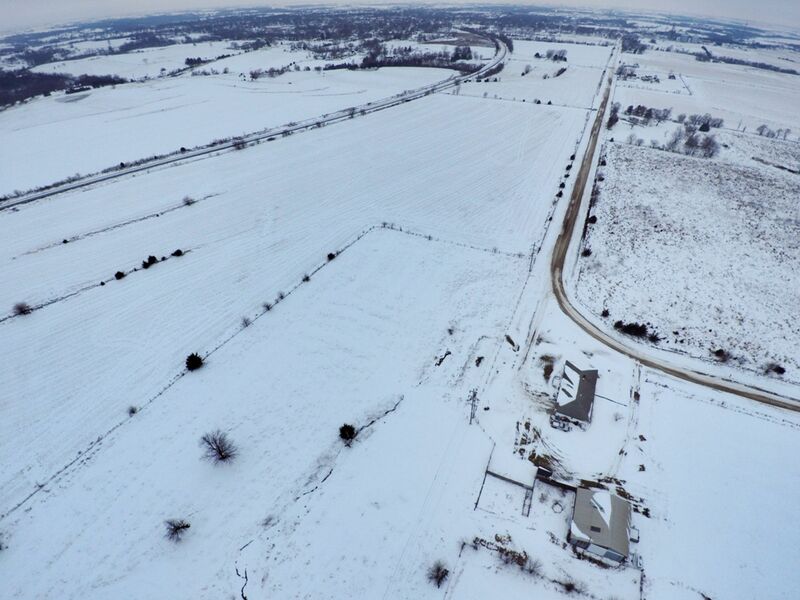 The West Half (W 1/2) of the Southwest Quarter (SW 1/4) of the Section 10 Township 72 North Range 25 West in Clarke County Iowa. Exact legal will be taken from the abstract. 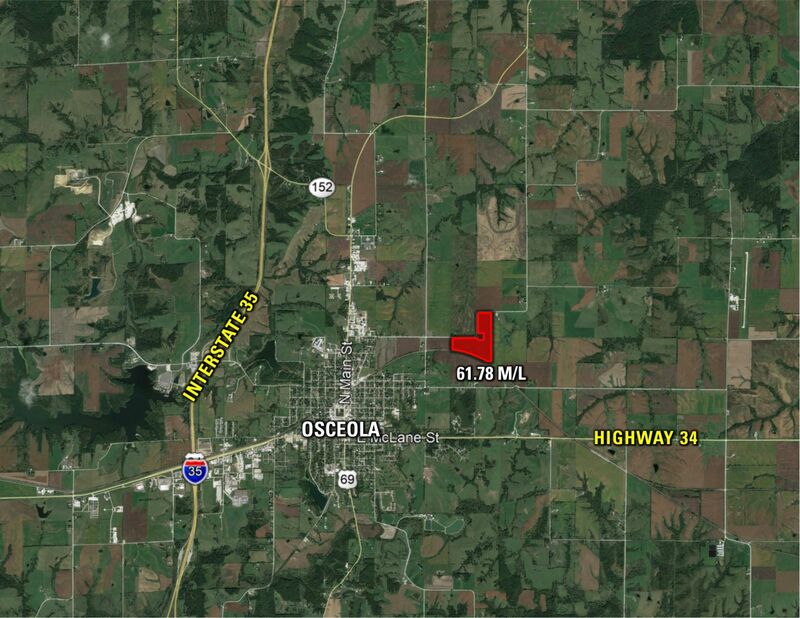 From Osecola travel North on Highway 69/ N Main St. and turn East onto Townline Rd. and travel for approximately 2.3 miles and turn right to stay onto Kendall St. 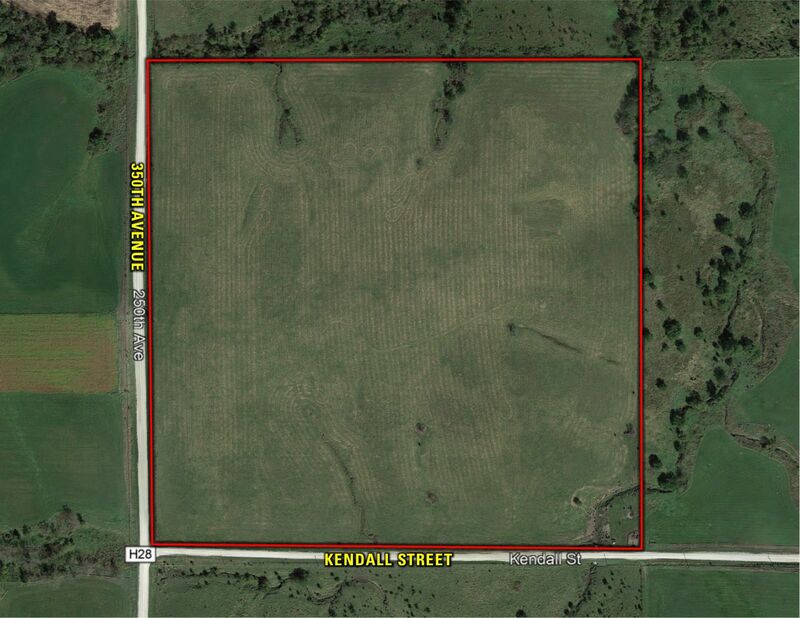 The property lies on the East & South side of Kendall St.